Looking at recent statistics, such as that it takes 19 plus attempts to get someone’s attention or 2.7 seconds on a website, businesses are resorting to all sorts of tactics just to get noticed. Standing out in a busy crowd can be tough, but using mistakes is surely always a negative? Once upon a time most mistakes would have been corrected as quickly as possible, but modern mistakes are often highlighted as companies try to style it out rather than cover it up. In the age of social media things can go viral and cut across target markets and enable awareness, making it an interesting tactic to deploy. 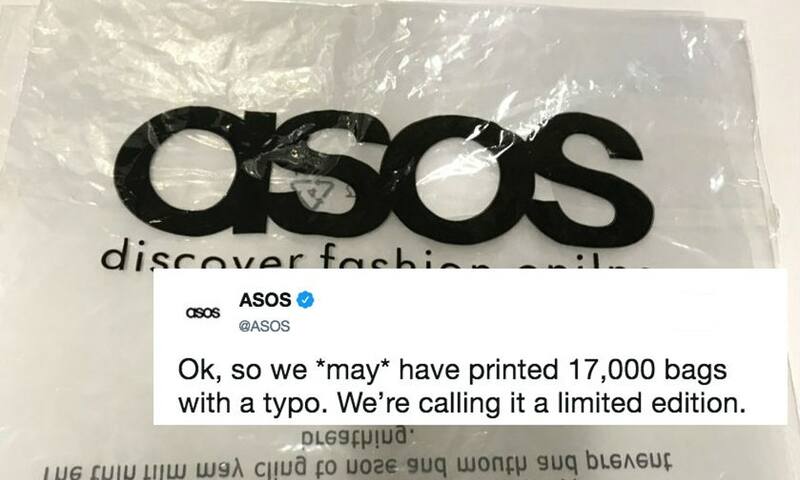 Take the ASOS packaging example that went viral rapidly and is still knocking around today, turning a negative into a positive by suggesting that the wrong packaging is more exclusive than the correct packaging. Read more here. In an impersonal world, modern mistakes are seen as humanistic, a ‘real’ person has made a genuine mistake, a misworded phrase or two sentences that have another meaning when put together. Would you be prepared to stoop to the level of making a deliberate mistake, if in fact it's ‘stooping’ at all? What is making a great mistake? The mistake has to be believable, clever, controversial or funny. Clever ones don’t tend to involve grammar, but something that could have been a mishit on a keyboard. It has been widely reported that spamming emails we often receive contain bad grammar on purpose and appear to have been written by someone who’s first language isn’t English. Possibly designed as a way to attract the easily manipulated and weed out the people that dismiss it almost immediately after reading the first sentence? Either way, creative writing is becoming about results, so a range of tactics are used to reach those targets. Our business brains have been taught to identify errors and fix them. When you see an error in text (pictures, photos or anything for that matter), you note it and assess it, usually in an instant. You can’t help judging the author or reacting to them. Whatever you do, you give it more time than you do ‘normal’ everyday writing. In our opinion, you still can’t beat well thought out content; educational, engaging and nurturing. The below could all be genuine, what are your thoughts? Why do phishing emails have spelling and grammar mistakes? If you have any examples of the good, bad and the ugly send them in! Here at Secret Source we manage content for many of our clients. If you need some help in this area, or with your wider marketing strategy, fill in the form below and we'll be in touch.